A civil communications satellite built to link senior Russian government leaders and a variety of international customers launched to its 22,300-mile-high perch in space Monday aboard the first Proton rocket mission of 2008. The Proton booster rocketed away from Complex 200 at the Baikonur Cosmodrome in Kazakhstan at 0018 GMT Monday (7:18 p.m. EST Sunday). Within 10 minutes, the Proton's three core stages each fired and jettisoned as planned, leaving the launcher's Breeze M upper stage to complete a series of burns to place the Express AM33 satellite into its targeted orbit. Spacecraft separation occurred on schedule about nine hours after liftoff. Officials reported the Proton accurately delivered Express AM33 to its preliminary orbit, and the satellite deployed its power-producing solar panels a few minutes later. The 5,732-pound spacecraft will be stationed along the equator at 96.5 degrees east longitude, where its communications instruments can reach homes and offices in a swath stretching from the Asia-Pacific region to Eastern Europe. After ground controllers complete a round of tests to confirm the satellite's readiness, Express AM33 will be pressed into service in late February or early March. Owned by the Russian Satellite Communications Co., Express AM33 is designed to supply users with Internet, video, radio, and data services for at least 12 years. The craft will also provide mobile communications services for the Russian president and other top government officials, according to the satellite's state-owned operator. 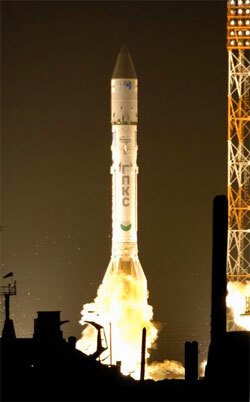 "The new satellite will be capable of satisfying the growing demands, first of all of the Russian state and commercial customers, on up-to-date communications and broadcasting services (including) HDTV, value added services, and multi-function VSAT networks," said Yuri Izmailov, acting director general of RSCC. Express AM33 carries 16 Ku-band, 10 C-band and one L-band transponder equipped with steerable antennas to focus on key markets. NPO PM was the primary contractor for the satellite, while Thales Alenia Space provided much of the communications payload. The craft's high-powered communications system includes several improvements over earlier Express satellites, allowing customers to use smaller Earth antennas, according to a written statement by RSCC. A similar satellite named Express AM44 is expected to be ready for launch on a Proton rocket in June, the Russian Federal Space Agency said on its Web site. That mission will also orbit another new-generation Express satellite. The next Proton rocket will launch the Norwegian Thor 5 communications satellite during a Feb. 10 mission under the auspices of International Launch Services.